After living in a tiny house and sharing a small bathroom vanity with my husband, I knew I wanted a place of my own to get ready in the morning. Seeing the perfect location in front of a window in our master bedroom, I was excited to put a classy new vanity in front of it with the morning light streaming in. 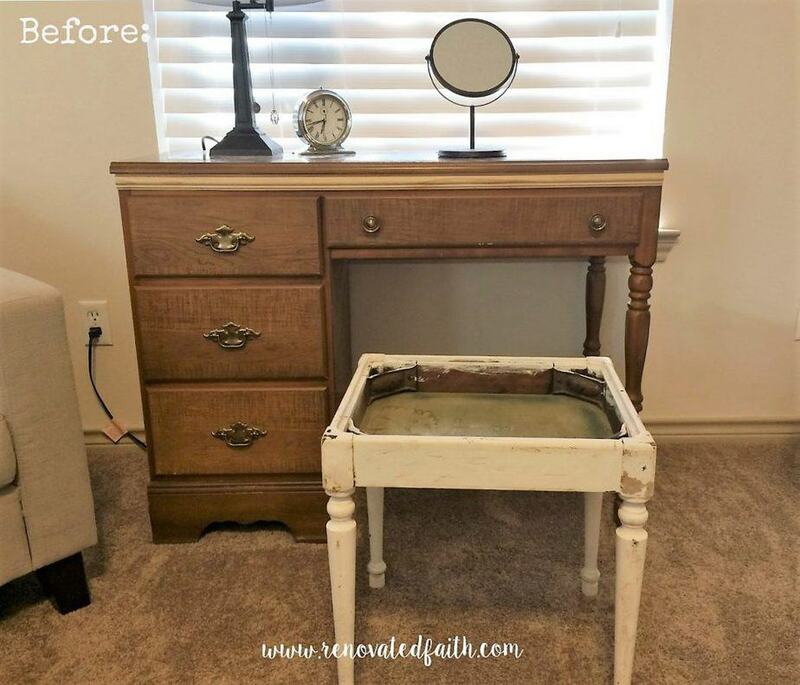 Not only did I love this DIY Vanity Makeover but it also helped me to see how God restores our own brokenness. Now that I had built up my own expectations of this glamorous vanity table, it was time to go shopping where I find all my favorite treasures…a used furniture store. Other than saving money, I wanted to make this piece my own. 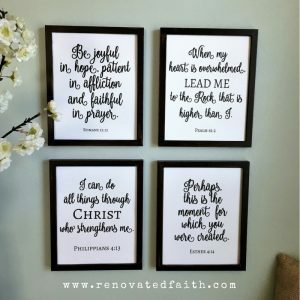 As I sanded, wiped, painted, my mind couldn’t help but to meditate on some specific ways God works in our lives much like I was working on the desk. Upon seeing this desk at the consignment shop among the many other pieces, I knew it would be perfect as a vanity table, a piece I would truly enjoy and call my own for years to come. I had a much better purpose for this old desk and knew it had incredible potential, but it would need a serious makeover. In the same way, God sees us through our brokenness. In spite of the dated molding, shiny laminate surface, burnt orange stain and weird smell, I loved that sad old desk and knew I needed it as my own. Who knew something destined for a trash heap would be one of my greatest treasures. The same could be said of us. Because of the stain of our sin, we deserve the trash heap but God cleans us up, transforms us and prepares a perfect place for us in His Home. The definition of “redeem” is “to regain possession of something in exchange for payment.” I bought this desk for $40 and the stool for $10. In order to transform this desk, I had to first buy it. There was a price to be paid, even for a dirty old desk. The same can be said of us – we are but damaged goods in need of transformation. Our sin was so much filthier than an old piece of furniture, but a much higher price would need to be paid to give us a right standing before a perfectly holy God. God knew no amount of good works would ever be able to rectify our sinful condition so he did the extraordinary. He pulled us out of the ruble and God had to pay the ultimate price – His one and only son. 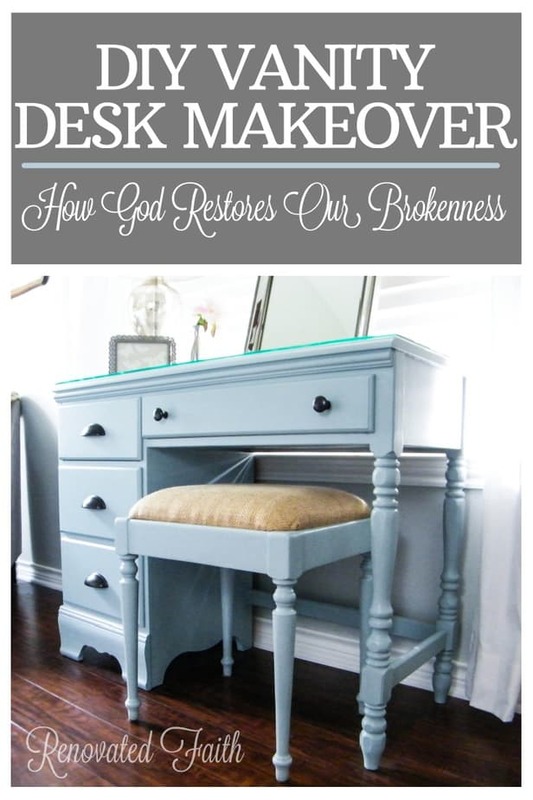 God rescued us from sin just like I rescued the desk from its awful fate. God doesn’t stop there. Upon rescuing us, He begins an amazing process of transformation because He loves us too much to just leave us alone. Upon coming to know Christ, an amazing process of renovation begins. I wasn’t about to bring this desk into our newly decorated bedroom and use it in its current state. Over a period of time and in several steps, a transformation had to occur. 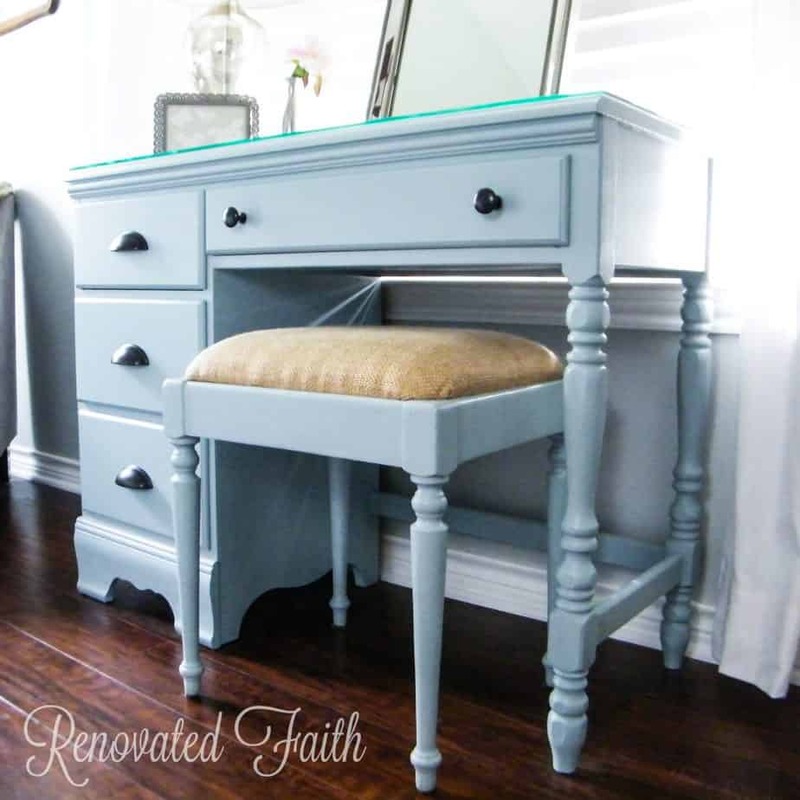 To achieve my vision for this desk, if it was cleaned, sanded, primed, painted and new hardware was added. Each step had to be fully finished before proceeding to the next. When God brings us into His family, He continues to transform us to be more and more like Him through the process of sanctification. He renews us daily knowing that sometimes the sanding of life’s trials can be difficult. However, we are much more content and satisfied when we allow Him to work in us to fulfill the specific plans He has for us. He breaths in us life, beauty and purpose that we never knew was possible. I took off the hardware and filled holes with a generous amount of Elmer’s wood filler. Then, I drilled new holes for the new hardware. I also replaced some old molding with new molding from Lowe’s by using Liquid Nails for wood. After letting the filler dry for 48 hours, I started the sanding process. I used my mouse sander to sand with rough sandpaper to remove that laminate gloss and I just sanded the legs as best as I could by hand. After wiping with a damp cloth, I primed the whole piece with Zinnser 123 water based primer and let it dry 4 hours. (It dries fast but not as fast as other primers. This is helpful because it leaves a smoother finish). I sanded again with smoother sanding pad on my mouse sander and sanded the legs by hand. After wiping with a damp cloth again, I used the Home Depot brand 6 inch rollers (“Best” with the green line) because it gives you a really smooth finish. I applied two coats of Behr Blue Fox in a satin finish with Floetrol (added according to the instructions on the back). This helps the paint to settle better, leaving fewer brush strokes. After letting the piece dry for 2 days, I added the new hardware (amazon.com) and the glass top. Who knew the desk could look so different!?! 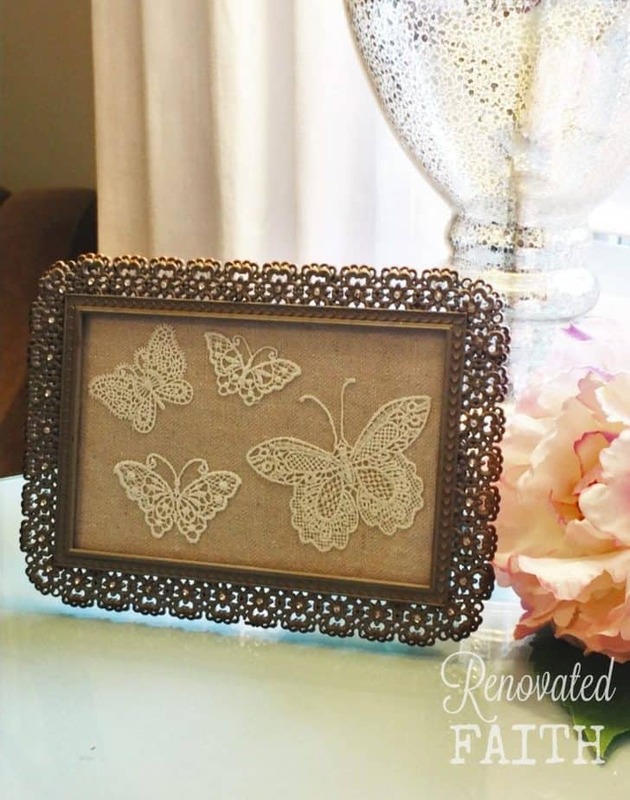 I thought my DIY butterfly frame was a perfect accessory for my vanity. I posted in When Anxiety Knocks and God Answers about how I made it and what butterflies mean to me. 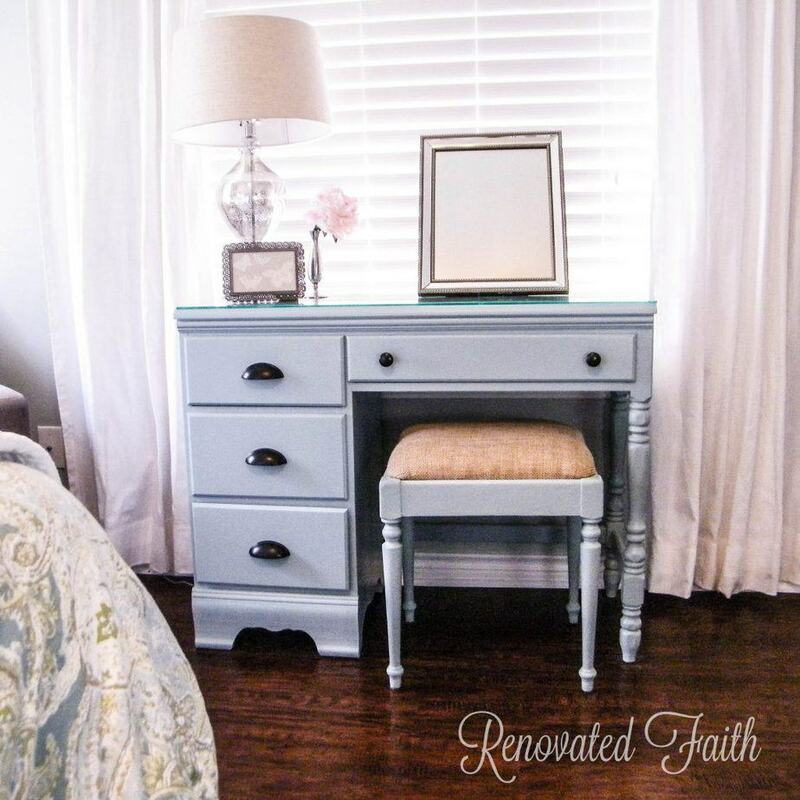 This is a sneak peak of my Master Bedroom transformation that I’ll be posting soon! Be sure to leave a comment below. I love to hear your feedback! If you want to save this post for later, pin it here! Oh wow, I love how it turned out! Great job!!! Looks beautiful! Great job and I enjoyed hearing your thoughts! I am hopefully going to work on a few projects soon as well. Thanks for your encouraging words! It was a lot of fun. This is so cool!! It turned out great! 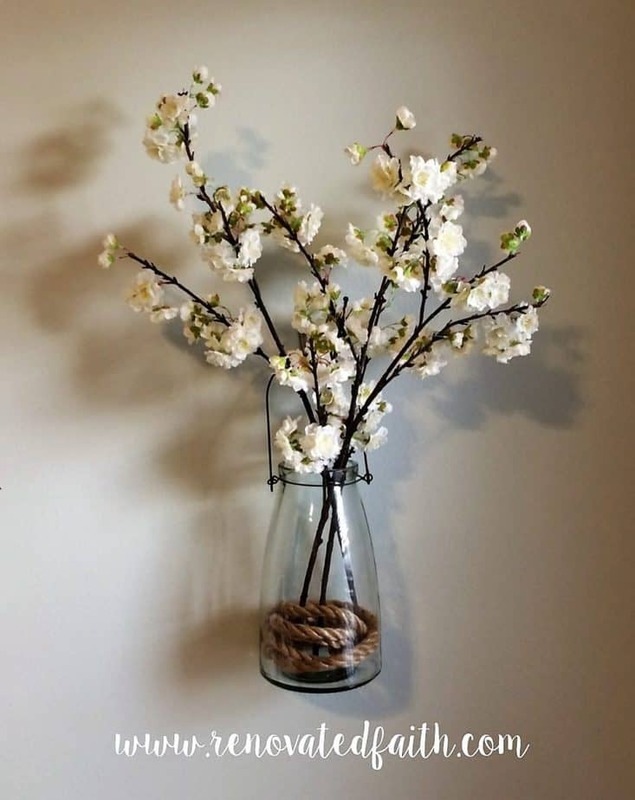 I absolutely love the concept of your blog! So unique! Kudos to you, and I know God will use this mightily to draw others to Him. I can’t thank you enough for cheering me on. It’s definitely a different concept! I so appreciate your encouragement. this is goooorgeous!!!! pinning and tweeting! Love it! I actually just redid a desk in my room. I definitely will not be looking at it the same now. I love your analogy of the dirty old desk and stool to our lives without Christ and the steps needed to accomplish a transformation. 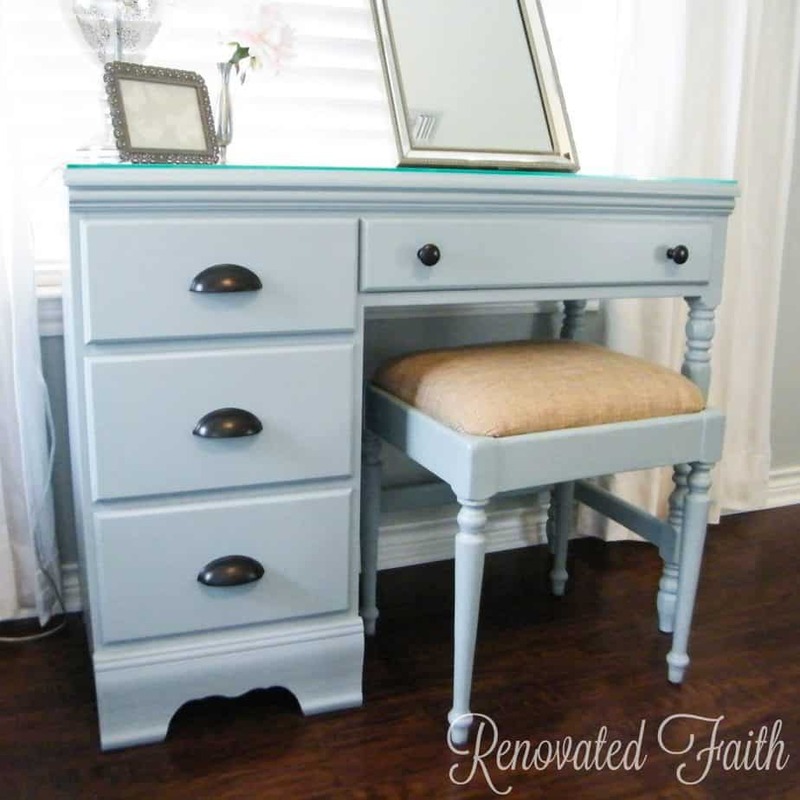 Beautiful post and beautiful outcome for your vanity. Everything is gorgeous! 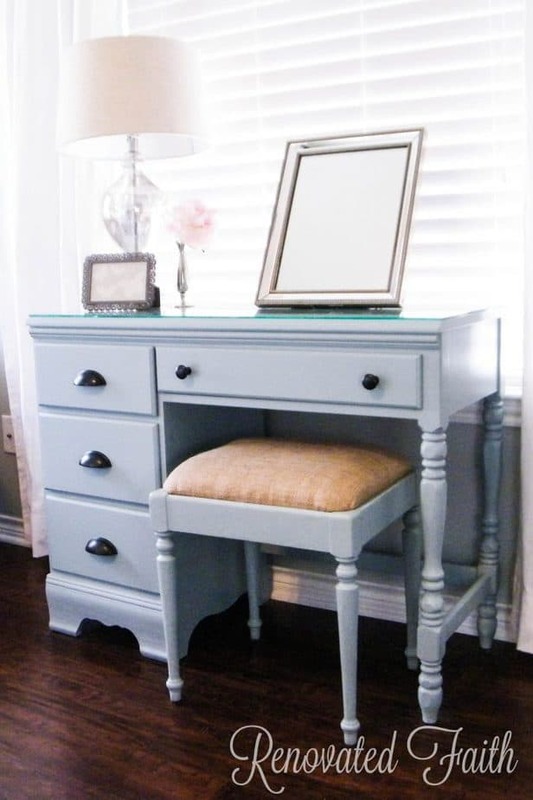 Your vanity is beautiful! And so are your thoughts about the believer’s own transformation. I have similar thoughts about one of my treasured teacups. The saucer of my most treasured teacup fell to the floor and was broken into several pieces. It appeared ruined. But, my dear mother-in-law got out some glue, and worked patiently for awhile to piece it back together. It’s beautiful, and every time I use that cup, I am reminded that God takes the broken pieces of our lives and makes something beautiful out of them.